Germany’s influence in Middle Eastern affairs has been historically subtle when compared to other Western powers, with Berlin being more focused on its economic interests and soft-power, rather than military intervention. Germany’s staunch opposition to the Western-led regime change campaigns in Iraq and Libya, and its tendency to avoid partnerships with Israel’s enemies, have prompted analysts to describe its Middle Eastern policy as one of deliberate “benign neglect”. However, a combination of domestic factors and recent geopolitical developments in the Arab world have prompted Germany to become a major arms supplier for the Gulf Cooperation Council (GCC) states, underscoring the notion that geo-strategic and economic interests drive states’ foreign policies. Germany’s Nazi past led it to self-impose restrictions on international arms sales, the purpose of which was to avoid the transfer of weapons into the hands of governments in conflict zones or those that disrespected human rights. For decades following the War, most German arms sales were made under the auspices of the North Atlantic Treaty Organization, but the Merkel government ended this policy after the Euro crisis and ‘Arab Awakening’ erupted. In 2011, Berlin and Riyadh struck a multi-billion euro arms deal, whereby the Saudis agreed to purchase hundreds of German-manufactured tanks. 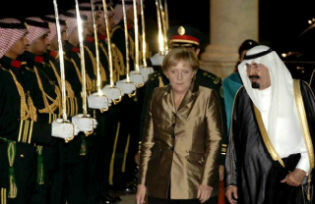 In 2012, Germany supplied Saudi Arabia with €1.24 billion of military hardware. The following year, a German defense firm (Krauss-Maffei Wegmann) won a contract worth €1.89 billion to supply Qatar with artillery systems and 86 tanks. According to the German government, German arms exports to the GCC totaled €817 million in the first half of 2013, on track to exceed the €1.42 billion reached in 2012 — which was already more than double the previous year. The Merkel government defended these deals on the grounds that such moves would help bring stability to a volatile region and fight terrorism. But grander geopolitical factors involving the Iranian-Saudi duel for regional hegemony in the Arab world — in addition to Iran and Israel’s ongoing military standoff — also influenced Germany’s decision to export arms to the GCC. For many years, Germany’s alliance with Israel, and its preoccupation with human rights, deterred Berlin from exporting arms to Arab states. But the recent agreements with the GCC should not be seen as the Merkel government placing distance between Germany and Israel. On the contrary, Israel approved of the deepening of German-GCC military ties. This ultimately underscores the reality of Israel and Saudi Arabia’s tacit alliance, largely driven by their mutual interest in countering Iran’s influence in the Arab world, and Tehran’s presumed nuclear weapons ambitions. Germany’s relationship with the post-1979 Iranian government has historically been the best among the western European nations, but Germany has aligned itself with the U.S. and Israel vis-à-vis Iran since Merkel became Chancellor in 2005. The German leader joined the American and Israeli bandwagon early on by calling for stringent economic sanctions against Iran. By arming Saudi Arabia at a time when Tehran and Riyadh are competing for influence across the Middle East, Berlin is intent on strengthening Saudi Arabia’s hand at Iran’s expense. The timing of Saudi Arabia’s evolving relationship with Russia also permits Germany to grow closer to Riyadh with less concern about how such a development could potentially harm German-Russian relations. The Syrian crisis, which symbolizes the polarization of Saudi and Russian regional objectives, has come to define how the Saudis and Russians view each other. Yet, despite their opposing positions vis-à-vis the continuation of the Al-Assad regime, the two states have left room to advance their mutual interests – a realization underscored by Prince Bandar’s recent visit to Moscow. Riyadh and Moscow share deep interests in the Syrian state’s survival, given that neither wants al-Qaeda-run Islamic Emirates being established in Syria, for fear of a miniature Pakistan forming in the Levant. Furthermore, although Saudi Arabia shares many of Turkey’s regional objectives, both the Saudis and Russians feel threatened by Ankara’s pro-Muslim Brotherhood foreign policy. Egypt’s turmoil also brings Riyadh and Moscow’s interests closer, as the Egyptian military understands that it has Saudi Arabia’s full support and may need to turn to Russia for maneuverability should Western condemnation of the armed forces’ crackdown on Morsi loyalists evolve from rhetoric to reduced or suspended aid. If Russian-Saudi relations can continue to thaw, Germany has much to gain. During the first 11 months of 2012, German exports to Saudi Arabia (primarily hydro chemical products and petrochemicals) and Saudi exports to Germany increased 71 percent and 28 percent, respectively. Total Germany-Saudi commercial trade rose 47 percent last year. As Germany heavily depends on Russia for the importation of natural gas, Berlin will presumably be careful to ensure that it does not pursue policies in the Middle East that would jeopardize German-Russian economic relations. Although arms exports are highly sensitive in Germany, Merkel has demonstrated that she is not afraid of controversy. Many of her political opponents consider her shift in foreign policy to be misguided. Jav van Aken, a Left Party MP, accused Merkel of “…becoming the Arab despots’ favorite girlfriend”. Some of Berlin’s decisions over arms sales to Saudi Arabia will reportedly be postponed until after next month’s general election, in which Merkel seeks re-election. Germany’s government also recently announced that decisions over arms exports to Egypt’s military will be delayed due to ongoing turmoil and uncertainty. If Merkel wins another term and Germany increases its arms exports to authoritarian governments across the Middle East and North Africa, it will become increasingly difficult to argue that German foreign policy is shaped by respect for human rights. It is no secret that the German military equipment being purchased by Saudi Arabia will most likely be used to crack down on anti-government demonstrations inside Bahrain, and/or the Shia-majority region of eastern Saudi Arabia. The Kingdom’s recent involvement in Bahrain and Yemen underscores its aggressive and pro-active opposition toward political change on its borders. If Saudi Arabia employs its security forces to directly influence the course of events in other nations in the region, Germany may soon be perceived as having helped prolong the region’s Ancien Régimes, at a particularly sensitive time. Germany is undoubtedly betting that its economic and geopolitical interests are likelier to benefit from its approach to arms sales in the Gulf. Given all that has happened in the region over the past two years, there is a good chance it will be proven right. *Daniel Wagner is CEO of Country Risk Solutions, a cross-border risk advisory firm, and author of the book “Managing Country Risk”. Giorgio Cafiero is a research analyst with CRS based in Washington, D.C.